A team of astronomers has observed evidence of ancient impacts that are thought to have shaped and structured our Milky Way galaxy. Their research presents observational evidence of asymmetric ripples in the stellar disk of our galaxy, which had long been thought to be smooth. 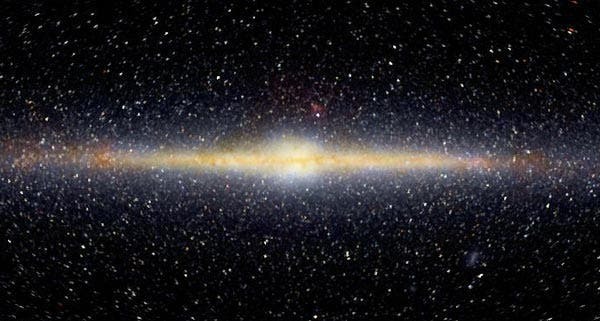 Using observations from the Sloan Digital Sky Survey (SDSS) telescope in New Mexico, the University of Kentucky team analyzed the spatial distribution of 3.6 million stars and found ripples interpreted as evidence of the Milky Way’s ancient impacts, which could include an impact with the massive Sagittarius dwarf galaxy some 0.85 billion years ago. This new paper continues Gardner’s earlier studies of the breaking of north/south symmetry in the stellar disk of the Milky Way. Their earlier work revealed an asymmetry that appears as a vertical “ripple” in the number counts of the stars as one samples in vertical distance away from the center of the galactic disk. In the new paper, the team analyzed the largest sample yet, and confirmed their earlier interpretation of the north/south asymmetry and found evidence for symmetry breaking in the plane of the galactic disk as well. Ferguson is the lead author on a paper that published this week in the Astrophysical Journal (ApJ). Ferguson conducted the research as an undergraduate student with co-authors Susan Gardner, a professor of physics and astronomy in the UK College of Arts and Sciences, and Brian Yanny, a staff scientist and astrophysicist in the Fermilab Center for Particle Astrophysics.